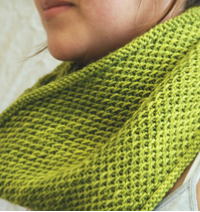 Keeping it on the easier side, Kate will show you how to use slip stitches to make this versatile cowl. Short and long size available. Just pick out 225 - 450 yards of your favorite worsted weight yarn and a size US 8 24” to 32” circular needle. Homework: Cast on for chosen size.